Jun 01, 2013 — EcoMedia launches the "TekSavvy Smart Fleet"
TekSavvy chose a non traditional branding approach by teaming up with EcoMedia to execute a mobile awareness campaign. 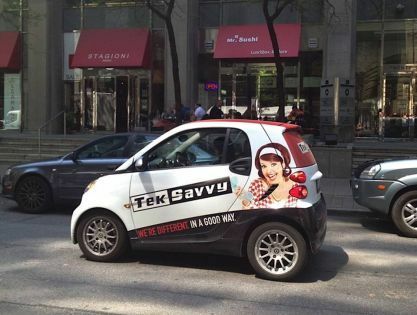 Phase one of the project will include 6 Smart cars wrapped with the TekSavvy brand, covering the GTA and the Golden Horseshoe to increase our Brand awareness, says Tina Furlan, Marketing Director, TekSavvy. We are exited about this initiative and our relationship with TekSavvy. We are aware that this approach was tried in the past with rather little success, because of lack of visibility based on limited hours of operation. Our cars will be on the road a minimum of 8 to 10 hours daily, driving about 50,000 km per year guaranteeing maximum exposure. We are very happy that we were able to come to an Agreement with The Messenger International using the vehicles for their daily deliveries and in the process take some of the larger and/older cars of the road benefiting the environment, says Erich Genseberger, CEO EcoMedia. EcoMedia has completed the installation of 56 SilverBox Units, each holding two Mini Billboards in the City of Port Coquitlam. 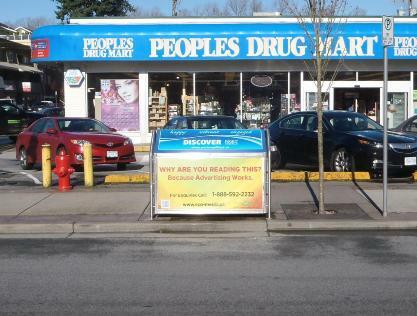 "With this installation, we now have over 600 Mini Billboards available in the lower Mainland. This is another important step in establishing ourselves in the Greater Vancouver Area", says Erich Genseberger, CEO EcoMedia. We are focused in growing our business in Western Canada and our target is to have over 2000 locations available by 2015, Genseberger said. 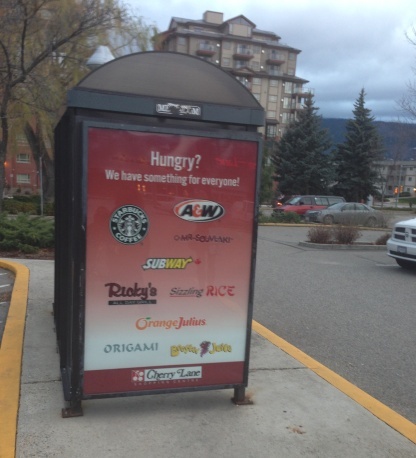 The City of Penticton , BC, has signed an agreement with out-of-home media company EcoMedia Direct, based in Maple, ON, for the advertising rights on Bus Shelters and Benches. 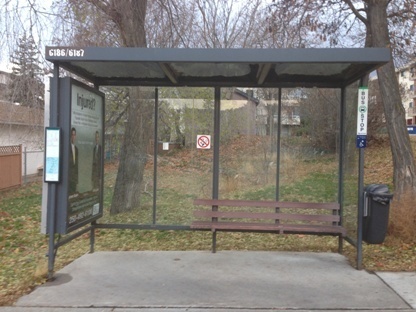 "We are ecstatic about our new partnership with the City of Penticton, as this is our first expansion into the Bus Shelter and Bench advertising market. With this new partnership in place we are perfectly poised to aggressively pursue Bus Shelter and Bench advertising opportunities throughout Canada", said Erich Genseberger, CEO EcoMedia Direct. 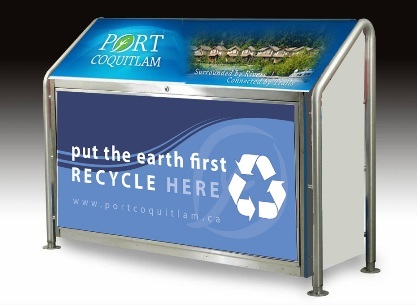 EcoMedia and the City of Port Coquitlam, BC, officially engaged in a long term agreement permitting EcoMedia to install its SilverBox Advertising/Recycling Units, at highly visible locations in the Downtown Area of Port Coquitlam. "We are very excited about our new partnership with the City of Port Coquitlam, BC, as we continue to grow in the Province of British Columbia. With this new Partnership in place we have increased our inventory to a total of 570 mini Billboards within the Greater Vancouver Area", said Erich Genseberger, CEO of EcoMedia Direct Inc.
EcoMedia Direct Inc. has expanded its out-of-home inventory to include 130 Mini Billboard advertising displays throughout the Maritimes. The new inventory is located in Cities, Municipalities, Shopping malls and the Dalhousie and St. Mary�s Universities. EcoMedia has similar installations for approximately 1600 Mini Billboards in various markets nationally. "We are exited to have reached this agreement with Advocate Printing and Publishing, giving us exposure in the Maritimes and enabling us to expand our offering to a new and exiting market, said Erich Genseberger, CEO, EcoMedia. May 01, 2012 — EcoMedia signs Agreement with Aurora Centre. 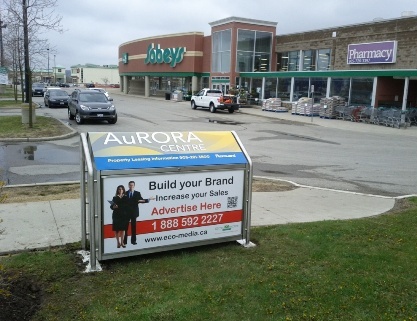 Aurora, ON - We are pleased to announce that EcoMedia has reached an Agreement to place its SilverBox Recycling/Advertising Units at the Aurora Centre property. Like all our other Shopping Mall properties, the Units are strategically placed to achieve the maximum benefit for the Environment and yet give our Advertisers maximum exposure for their Advertising Dollars spend. This is yet another important expansion for EcoMedia to achieve critical mass within the Shopping Mall segment of our business. With over 9 Million Visitors annually, is the perfect advertising medium if you are looking for POP (point of purchase) placement, says Erich Genseberger, CEO, EcoMedia. April 16, 2012 — EcoMedia signs Agreement with Cambridge Centre. 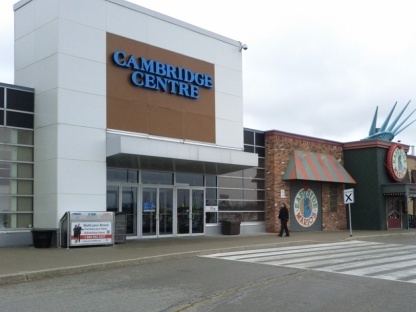 Cambridge, ON - We are pleased to announce that EcoMedia has reached an Agreement to place its SilverBox Recycling/Advertising Units at the Cambridge Centre property. Like all our other Shopping Mall properties, the Units are strategically placed to achieve the maximum benefit for the Environment and yet give our Advertisers maximum exposure for their Advertising Dollars spend. This is yet another important expansion outside the GTA to offer a prodder Media offering to our Clients . With over 7 Million Visitors annually, is the perfect advertising medium if you are looking for POP (point of purchase) placement, says Erich Genseberger, CEO, EcoMedia. 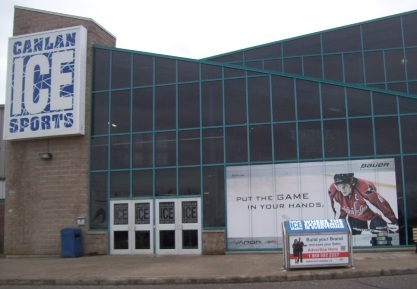 March 20, 2012 — EcoMedia signs Agreement with POWERADE Sport Centre Inc.
Brampton, ON - We are excited to announce that EcoMedia has signed an agreement to place its Advertising/Recycling Units strategically around the POWERADE Sport Center in Brampton. With have a National presence already in place this is a welcome addition for our National Clients. With POWERADE Centres on Board, we cover now 17 major Ice Rinks throughout Canada, says Erich Genseberger, CEO, EcoMedia. 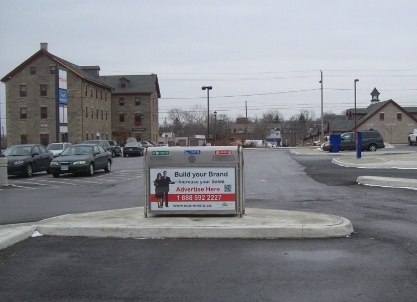 February 21, 2012 — EcoMedia signs Agreement with Gorge Holdings Inc.
St Catherines, ON - We are pleased to announce that EcoMedia has reached an Agreement with Gorge Holdings Inc. to install sit SilverBox Advertising/Recycling Units at Shopping Malls in St. Catherine and Thorold. This is our first Shopping Mall installation in the Niagara Region and it will complement our GTA locations in a very positive way. It is another step forward to expand our business outside the GTA, says Erich Genseberger, CEO, EcoMedia. 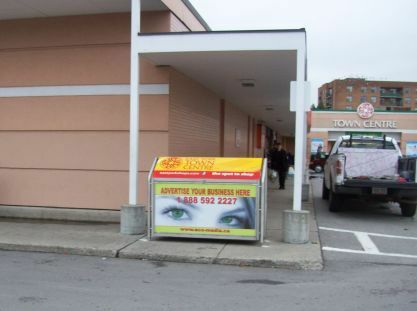 Toronto, ON - We are pleased to announce that EcoMedia has reached an Agreement to place its SilverBox Recycling/Advertising Units on Centerpoint Mall�s property. 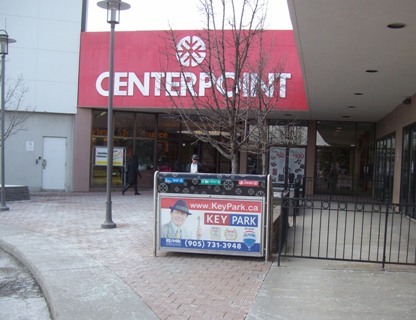 Like at the East York Town Center, the Units are strategically placed to achieve the maximum benefit for the Environment and yet give our Advertisers maximum exposure for their Advertising Dollars spend. With over 7,75 Million Visitors annually, is the perfect advertising medium if you are looking for POP (point of purchase) placement, says Erich Genseberger, CEO, EcoMedia. 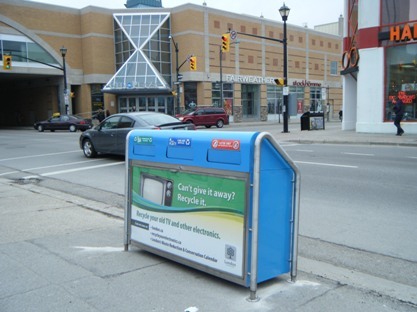 Toronto, ON - We are pleased to announce that EcoMedia has reached an Agreement to place its SilverBox Recycling/Advertising Units on East York Town Centers property. The Units are strategically placed to achieve the maximum benefit for the Environment and yet give our Advertisers maximum exposure for their Advertising Dollars spend. With over 5 Million Visitors annually, is the perfect advertising medium if you are looking for POP (point of purchase) placement, says Erich Genseberger, CEO, EcoMedia. Toronto, ON - EcoMedia is pleased to announce it has signed a long term agreement with CanLan Ice Sports the largest independent owner and operator of Hockey Arenas in the Country, to provide SilverBox™ Recycling/Advertising Units at Arenas located in Etobicoke ON, Oakville ON, Scarborough ON, York Campus ON, Oshawa ON, Broussard QUE, Burnaby BC, North Vancouver BC, Langley BC, Armstrong BC, Edmonton AB, Saskatoon SK, Regina SK, Winnipeg MB. This is another step to increase our National presence and get closer to be able to offer OOH Media packages at extremely discounted rates compared to traditional Media offerings, says Erich Genseberger, CEO, EcoMedia. Burnaby, BC - The Burnaby Board of Trade and the City of Burnaby yesterday announced the finalists for the 12th Annual Burnaby Business Excellence Awards at a business luncheon attended by community and business leaders from across the Lower Mainland. The Burnaby Business Excellence Awards were created to recognize businesses, individuals and non-profit organizations which have demonstrated outstanding success and have had a positive and significant impact on the community. The winner of each category will be announced at the Burnaby Business Excellence Awards Gala on November 2nd. The Burnaby Business Excellence Awards (BBEA) is one of the Lower Mainland�s most celebrated business awards programs, recognizing organizations and individuals that have made an exemplary contribution to the business landscape. Since its inception in 1999, the BBEA has helped the City of Burnaby emerge as a host city for world-class organizations. The Burnaby Board of Trade (BBOT) is Burnaby�s pre-eminent business association and is a key part of the City�s economic development strategy. Working closely with the municipality, the BBOT supports the growth of business both locally and internationally, and fosters a sustainable business environment through networking, education, advocacy and development. Through our vision and leadership, we facilitate a collaborative community model involving business, not-for-profits, academia, citizens and all levels of government. Designed to Sell... this new leading-edge LED Backlit Sign is 24/7. In fact, this "Full Service Program" means EcoMedia will design, print, install and relocate the Display Sign to enhance and empower every Property that is 'For Sale'. Maple, ON -- EcoMedia today announced the unveiling of a new innovative Display Sign/Support Program for Real Estate Brokers/Agents, to assist them in promoting their images and brand messages to prospective buyers, and sellers, in both Residential and Commercial markets. "Based on the feedback of many of our Realtor clients, it became evident this industry needs a change, and new approach, to the way properties are advertised. In order to enhance not only the look and quality of a Sign placed on a �For Sale� property, EcoMedia now offers a backlit Display Sign to enhance the appearance during daytime, and really drive home the point home after Sunset," says Erich Genseberger, CEO, of EcoMedia Direct Inc.
"EcoMedia will offer this new program as a full service venture, from printing posters, installing the frame with the light box on the (lawn) property - right through to sign removal/relocation of the Unit after the successful closing by the Realtor," Genseberger says. "This new way of Real Estate promotion will most definitely result in increased Sales by anyone opting to adapt to change. Of course, there are costs involved in having this service, but considering the positive impact it is going to have on their business the cost is going to be negligent." The Company plans to officially rollout the Program next month at one of the Major Industry Trade Shows in Toronto. In photo: Kenneth Bokor, Chairman of the SouthFields Residents Association, stands beside the special graffiti resistant top canopy on EcoMedia�s SilverBox� Recycling Unit, featuring the local SouthFields logo/artwork. EcoMedia worked with the Residents, the Town of Caledon, and the Region of Peel, to ensure all stakeholders were pleased with the end result. 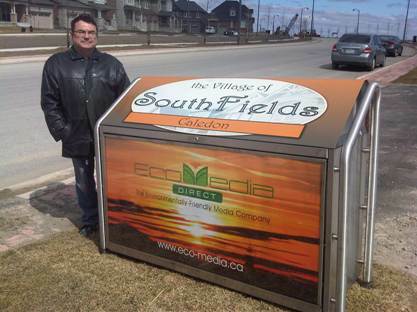 The SouthFields Residents Association in the Town of Caledon, Ontario, recently wrote to EcoMedia to extend their appreciation on the team effort to bring a Public Space Recycling Program to their New Community. The program was quickly implemented by all participants, and the result is a Cleaner and Greener Streetscape for SouthFields and its residents. When it comes to advanced technology, the LAVA infrared glass heating system is an innovative, eco-friendly product. Based on solar radiation principles, this heating panel product measures a non-intrusive 35 millimetres thick�comparable to a flat screen television. And unlike a regular space heater, the inferred panel does not create an electromagnetic force, and the quiet and efficient technology contains no moving parts. The panels, with the largest size weighing 35 kilograms, are considered stationary, hanging on a ceiling or wall. The product comes in various sizes. Perfect in form and timeless. Choose from one of five standard colours: pure white, pale green, red, black, or a mirror. All models can be horizontal, vertical or mounted on the ceiling. Upon request, these models are also available in satin finish. Depending on your heating requirements, you can choose from four sizes, with capacity ranging from 250 to 1000 watts. LAVA Bath glass radiator is the perfect solution to a cold bathroom. Say goodbye to foggy bathroom mirrors and wet towels. Depending on your needs and the size of your LAVA, you have the ability to add as many as four towel rails. LAVA Bath can be ordered in any finish, so if your bathroom already has a mirror, add some colour, your favourite photo,or incorporate a little "sparkle". Make LAVA your own and warm up your bathroom in style. Create an extraordinary masterpiece by adding the timeless and very elegant crystals to your LAVA. Choose from one of the three design options created by Destilat Design Studio or personalize your LAVA Crystal to satisfy your decor needs. LAVA Crystal sets new standards in the field of interior design. LAVA Light LAVA Light is unique on-off technology. Enjoy the necessity of a mirror in your bathroom combined with the functionality and luxury of infrared heat. Now add �lighting� to complete the package. With LAVA Light your mirror appears as nothing more than a mirror when the lights are off. When the lights are turned on, your LAVA will reveal an illuminated design. Choose from one of the existing designs from Destilat Design Studios or create your own illuminated masterpiece. LAVA Light combines practicality with design. And as an added bonus you never have to worry about condensation on your mirror again. All the panels are very optical, pleasing, single colours, customized with a picture or painting printed on the back of the glass, creating aspecialized new technology that will withstand the temperature without exposure to fading. This issue, CBJ spoke with Erich Genseberger, LAVA CEO, in best profiling the benefits of this cuttingedge infrared technology. An aesthetically pleasing product, LAVA incorporates any portrait and colours desired and, as Genseberger commented, "whatever you like to see the most." Easy and ideal installation allows for the product to be used in restaurants, bars, homes, and hospitals, particularly an ideal client where "installations in post-operation rooms [is ideal] because after surgery when the body cools it doesn�t heat up that quickly with regular heating, but the inferred heating makes it much faster to get your body to normal temperature,� Genseberger said. All production of the LAVA products is done in Genseberger's native Austria, and then subsequently distributed throughout Canada and the United States. With all production done in Austria, it takes about four-to-six weeks for the supplied artwork to be added in the creation of these unique heating systems. LAVA is environmentally friendly in that it substantially reduces a homeowner�s energy consumption, as it acts as an independent low energy heat source, with scientific studies showing that glass stores and emits heat better than other forms. The technology lends itself for a total installation as primary heating source, because, as Genseberger noted, most houses today have "cold spots" that can�t be reached by forced air system, meaning this technology could then be used as a secondary heating system. The beauty of LAVA is that it heats objects and heats the body, working on the principle of the sun. There is no duct work. Its 'eTouch' thermostat feature works on room temperature. Genseberger gives the example, "If you want your bathroom to be 22 C at 6 a.m., the thermostat will know when to start the panel." The product can also double as a bathroom mirror, as an example, that gives you the benefit that it will never fog up when exiting the shower, as it the panel is the primary heating source itself. This enriched interior design is a piece of artwork that provides not only comfort, but unparalleled performance. And The Winners Are � from left: Tim Fowler, Vice President, Finance, Food Division, MARS Canada Inc. (Business of the Year); Craig Tucker, Assistant General Manager, Boston Pizza (Consumer Choice Dining Award); Terry D'Ettore Owner of Walk, Run, Ride (New Business/Entrepreneur Start Up); James Ward, General Manager, Boston Pizza; Rachel Clingen, Rachel Clingen Wedding Event and Seasonal Design (Consumer Choice Service Award); David Tilson, MP for Dufferin-Caledon; Cindy Barratt, Naked Vine (Community Sensibility Award); Gary Dolson of EcoMedia (Impact Award); and Donna Forster, Forster Books (Consumer Choice Retail Award). 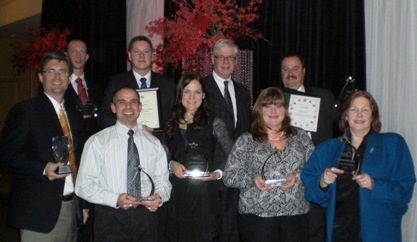 Close to 200 people were in attendance last Thursday evening at Caledon Woods Golf Club, where local businesses and major corporations with local ties to the community were recognized for their achievements in 2010, at the Annual Caledon Chamber of Commerce Business Excellence Awards. In addition to winning the Chamber's IMPACT AWARD, EcoMedia also received two Special Recognition letters - from Sylvia Jones, MPP for Dufferin-Caledon, the Province of Ontario; and from David Tilson, QC., M.P., for Dufferin-Caledon, House of Commons Canada. Kelly Darnley, President and CEO, Caledon Chamber of Commerce, said, "Tonight the Chamber membership presented one of its own with the Chamber's Environmental Award � this award is named the IMPACT AWARD because it reflects the good work of the private sector to reduce its negative impact on the environment and increase its positive impact on the community. This year the IMPACT AWARD was awarded to EcoMedia for just that reason," said Darnley. Georgian College nominated EcoMedia for the Award while two local businesses in Caledon, Prudential Select Real Estate and Garden Foods, endorsed the nomination. "On behalf of the residents of Dufferin-Caledon, I am very pleased to congratulate EcoMedia on receiving the 2010 IMPACT AWARD in recognition of Erich Genseberger, and your team for innovative products. 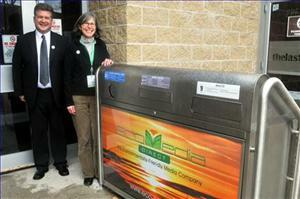 Your eco-friendly recycling units are making a real environmental impact in Caledon and throughout Ontario. Please accept my best wishes for many more years of success," said Jones. "Congratulations on being recognized for your sincere commitment to corporate social responsibility in our community. Thank you for consistently and diligently demonstrating progress in the areas of waste management, energy conservation, and social responsibility. Your commitment to protecting the environment through the use of Public Space Recycling Programs throughout Canada and the rest of the world is truly commendable. I wish you many more years of continued success," said Tilson. 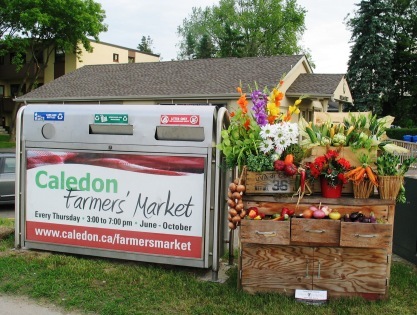 "We are extremely pleased to be recognized for our achievements, and we are proud to play a small role in helping Caledon maintain its designation as the Greenest Town in Ontario. The program is a partnership between the Town of Caledon, the Region of Peel and EcoMedia," said Erich Genseberger, CEO, EcoMedia. The Caledon Chamber of Commerce, celebrating its 25th year, selected Mars Canada Inc. as the Business of the Year. 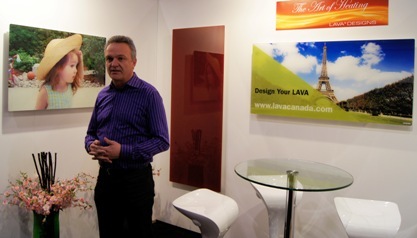 Toronto, Ontario � Lava®, an eco-friendly healthy heating system with proven credentials in Europe, was officially launched today in the Canadian market, and will be showcased later this month at the Interior Design Show, January 27 - January 30, 2011, at the Metro Toronto Convention Centre. "Lava is an infrared heating system which emits a very pleasant type of heat - we call it a 'clean' heat - and it resembles a piece of art, or glass, mounted on a wall, Lava looks like a modern flat screen panel, not a conventional heater people are used to seeing on the floor. In fact, Lava is unlike any heating system to reach North American soil to date," says Erich Genseberger, CEO, of EcoMeda Direct Inc., who recently signed an exclusivity Agreement with Etherma Heating in Austria, to distribute Lava Heating systems. "Lava is designed for a wide variety of residential and commercial applications," says Genseberger. "Our target is contractors, designers, and architects, however, we have already received website inquiries from people who manage College and University facilities, as well as interest from airports, condominium developers, even direct inquiries from home owners." Sue Ritcey, who recently joined the Lava Team in a Business Development capacity, says Lava can be used as a primary or secondary heating system. "Lava is especially ideal for entrance ways, bathrooms and hard to heat areas. This innovative product is also ideal for second homes because of its optional e-control thermostat system." "One of the most exciting and unique qualities of Lava is the customer's ability to customize the finish to satisfy individual design needs. Whether your preference is a mirrored finish, a family portrait, or favorite work of art, there are no limitations with Lava," says Ritcey. 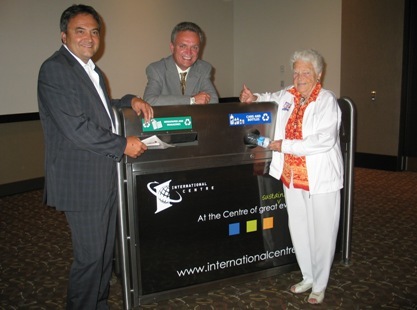 On August 10, 2010, Town of Caledon Council Members voted unanimously to award a long-term contract to EcoMedia for the supply, maintenance and advertising of the company�s SilverBox™ Recycling containers. This decision follows a Request for Proposal (RFP) issued in July, 2010, and awarded to EcoMedia. "We are proud to play a small role in helping the Town of Caledon maintain its designation as the Greenest Town in Ontario," said Erich Genseberger, CEO of EcoMedia Direct Inc. The program is a partnership between the Town of Caledon, the Region of Peel and EcoMedia. 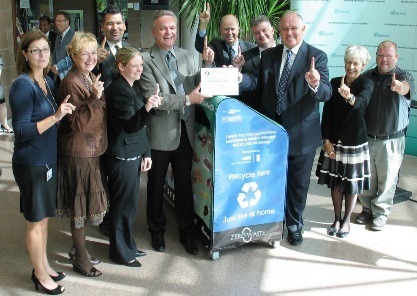 October 9, 2010 - Burnaby, BC -- What began as a Pilot Program last December when EcoMedia installed 50 SilverBox Recycling Units on the streets in one of Canada's most beautiful cities, culminated last Friday in the signing of a long-term partnership agreement. "We are very pleased today to announce this partnership which immediately expands the number of 50 units to 200 recycling units being installed on the streets of Burnaby," said Erich Genseberger, CEO of EcoMedia Direct Inc.
"This is a very significant partnership, and underlines the long-term commitment both Burnaby and EcoMedia have made to beautify the City's streetscape and further protect the environment," Genseberger said. The agreement permits EcoMedia to sell advertising on the panels located on its units - both on the traffic and pedestrian sides of the SilverBox stainless steel containers. While this is the first partnership agreement for EcoMedia in Western Canada, the company has been working with other Cities in BC, who have taken delivery of EcoMedia's portable Mobile Media recycling units for Special Events and Festivals. 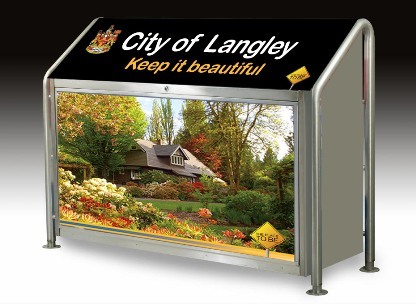 October 18, 2010 � EcoMedia and the City of Langley, BC, officially engaged in a long term agreement permitting EcoMedia to install its SilverBox Recycling Units containing advertising displays, at approved locations on public streets in the Downtown Area of Langley, for the convenience of the general public. "We are very excited about our new partnership with the City of Langley, BC, as we continue to grow in the Province of British Columbia," said Erich Genseberger, CEO of EcoMedia Direct Inc.
EcoMedia SilverBoxes are now installed at more than 30 different locations throughout Ontario and British Columbia, as part of a new long-term agreement with Campus Living Centres. Toronto, ON - October 19, 2010 - EcoMedia is pleased to announce it has signed a multi-year agreement with Campus Living Centres of Canada, the largest owner and operator of student housing in the country, to provide SilverBox™ Recycling Units at 18 CLC Residences located on College and University Campuses in Windsor, Kitchener, Niagara-on-the-Lake, Welland, Hamilton, Oakville, Brampton, Toronto, King City, Oshawa, Peterborough, Ottawa, and Sudbury in Ontario; and two CLC Residences located in Kamloops, and Merritt, BC. Campus Living Centres is a Residence Management and Development Company specializing in developing dynamic, integrated living experiences for College and University students. "EcoMedia is thrilled with our new partnership with CLC, and the opportunity to replace single stream garbage bins with our eco-friendly, and proven, three stream recycling units in high traffic areas, strategically located at the residences on College and University Campuses throughout Ontario, and in BC.," said Erich Genseberger, CEO, EcoMedia Direct Inc.
"Campus Living Centres has a proven track record of providing top notch customer service to post secondary students, and this new partnership further enhances CLC's program which serves literally thousands of students in Ontario and BC," Genseberger said. According to Michael Paul, Vice President, Operations for Campus Living Centres, "We care about the environment and are proud to partner with EcoMedia." OSHAWA - Recycling and composting when out and about in Oshawa is even easier with the installation of 22 new multi-sort containers at the Legends Centre, Alexandra Park and City Hall. "Thumbs Up for Oshawa's Public Space Recycling Pilot Program ... from left to right: the City of Oshawa's Stan Bertoia, Commissioner of Community Services Department; Denyse Morrissey, Director, Recreation Services, Community Services Department; Nathalie Henning, Manager, Waste & Environmental Programs, Parks and Environmental Services; Nester Pidwerbecki, Ward 3 Regional & City Councillor; Mayor John Gray, City of Oshawa; Ron Diskey, Manager, Community Centres and Events, Recreation and Culture Services; Erich Genseberger, CEO, EcoMedia; Joe Kolodzie, Ward 4 Regional & City Councillor and Chair, Community Services Committee; and Shannon McFadyen, Corporate Communications and Marketing Officer (front). 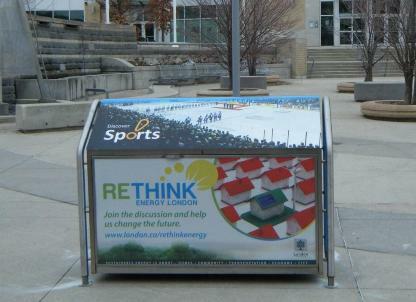 In the photo is EcoMedia SilverBox™ Recycling Unit recently installed at the Legends Centre in Oshawa. This clean and green pilot project runs from July to December and is a partnership between EcoMedia Direct and the City of Oshawa with EcoMedia Direct supplying the multi-sort units at no cost to the City. The outdoor multi-sort units include a slot for paper recyclables, one for cans and bottles and a slot for garbage. Four units will be installed at City Hall, three at Alexandra Park and five at Legends Centre. Also at Legends Centre, 10 four-stream indoor units will be installed that feature an extra compartment for organics. "Prepare To Be Amazed ... is branded on the top canopy of EcoMedia's SilverBox three stream recycling container just outside of the City of Oshawa's Civic Administration Building. 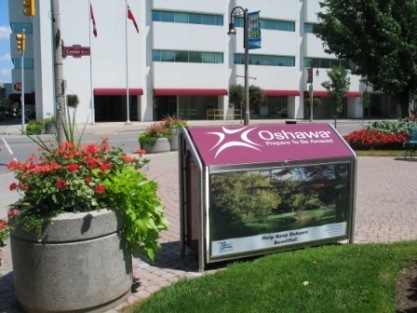 The City of Oshawa and EcoMedia recently partnered to launch the Pilot Program to the Media with Recycling Units now in place at City Hall, Alexandra Park, and Legends Centre. The goal of the pilot project is to increase the City's waste diversion rate through recycling opportunities for residents when away from home through the use of standardized recycling and composting units. During the pilot project, waste diversion rates will be measured and compared to existing waste diversion numbers. Legends Centre was chosen for the pilot as approximately 1.3 million visitors pass through its doors each year. This pilot supports the Community Strategic Plan by encouraging a clean green City. For more information, visit www.oshawa.ca. To receive City of Oshawa news through Twitter, RSS or to subscribe to the quarterly e-newsletter, visit: www.oshawa.ca/ecommunications. SilverBox™ Recycling Unit Only: Erich Genseberger, CEO, EcoMedia, Mayor Ric McGee, local real estate agent Ari Zider and City staff showcase the new SilverBox™ Unit at City Hall. 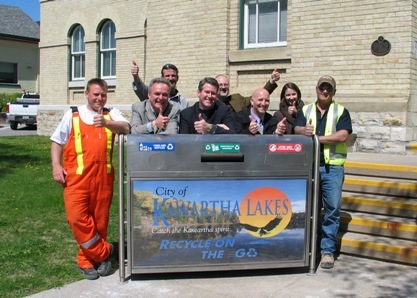 The City of Kawartha Lakes has partnered with EcoMedia Direct Inc. to place SilverBox™ Units City-wide. 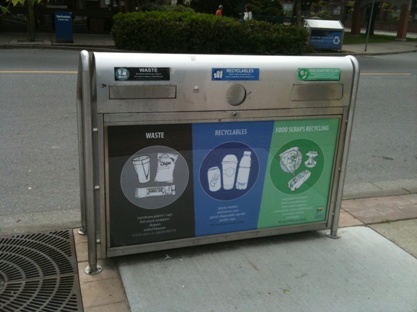 During May 2010, look for these recycle units as they will become part of our public space landscape; installed in areas of high pedestrian and vehicular traffic. "We are pleased to partner with such a beautiful City like Kawartha Lakes, and play a small part in helping to protect the environment," said Erich Genseberger, CEO of EcoMedia Direct Inc. "EcoMedia is prepared to offer the program city wide, not just the typical urban centres such as Lindsay and Bobcaygeon." All advertising on the SilverBox™ Units will be handled by EcoMedia Direct Inc. with the focus on engaging local businesses in advertising efforts. If your business is interested in advertising space please contact EcoMedia Toll Free: 1-888-592-2227 or visit their website at www.eco-media.ca . 'Recycle on the Go' or mobile recycle units will also be available through EcoMedia for City-wide special events. 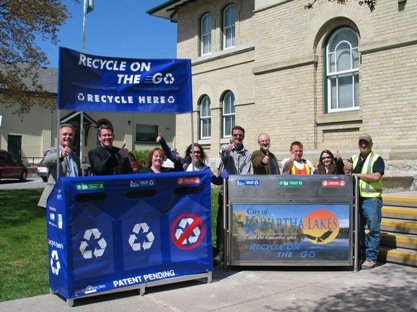 If you are an event organizer and are interested in this recycle option for your event please call 324-9411 or email recycle@city.kawarthalakes.on.ca , (or contact Craig Marwood at EcoMedia: Tel: 1-888-592-2227 ext. 235 or cmarwood@eco-media.ca ). Both mobile and SilverBox™ Units are designed for ease of use, accessibility and recycling will be sorted in the same fashion as your curbside recycling. This public space recycling program will increase the City's diversion rate continuing to make the City a cleaner and greener place for everyone to live, work and play. 'Recycle on the Go' Mobile Unit (EcoMedia's portable Special Events Recycling Unit with new overhead banner system) and SilverBox™ Unit: Erich Genseberger, CEO, EcoMedia, Mayor Ric McGee and City staff showcase the new SilverBox™ Unit at City Hall. Municipalities, like the Town of Markham, are busy preparing for the Vancouver 2010 Winter Olympic Torch Relay to arrive in their community, and EcoMedia has been called on to help promote Markham's Event, Thursday December 17th through a poster campaign using EcoMedia's SilverBox Public Space Recycling Units located on the streets in Markham. 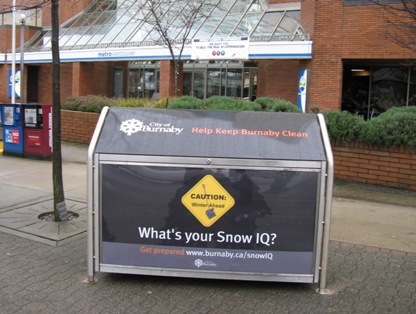 EcoMedia is assisting several Municipalities to promote their 2010 Vancouver Winter Olympic Torch Relay Celebration Events through local poster campaigns using SilverBox™ Public Space Recycling Units. 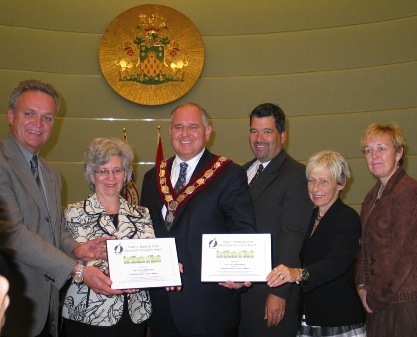 An Award-Winning Night ... Pat Vanini, Executive Director, Association of Municipalities of Ontario, presents the winning plaques to the Town of Markham and EcoMedia in Markham�s Council Chamber prior to the Council Meeting, on Tuesday September 29. In photo, from left to right: Erich Genseberger, CEO of EcoMedia; Ms. Vanini, AMO; Frank Scarpitti, Mayor of Markham; Peter Loukes, Director, Operations, Community & Fire Services Commission, Town of Markham; Claudia Marsales, Manager, Waste Management, Town of Markham; and Brenda Librecz, Commissioner of Community and Fire Services, Town of Markham. Markham, Ontario � Pat Vanini, Executive Director of the Association of Municipalities of Ontario (AMO) presented Peter .J. Marshall Award Certificates of Merit on Tuesday evening to the Town of Markham and EcoMedia Direct Inc. for their commitment to 'zero waste' at public events and civic centre waste diversion. "Markham has demonstrated real leadership in waste diversion," said Peter Hume, AMO President. "In addition to prudent public policies, every town staff member is doing their part by setting a persuasive example." The AMO in an earlier release remarked that Markham is, "committed to improving on an impressive 73 per cent residential waste diversion rate. In collaboration with its public space recycling contractor, EcoMedia, they set out to significantly improve waste diversion at public events and inside its civic centre. 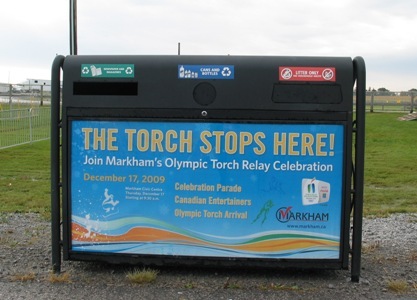 "Markham's 'zero waste' policy for public events prohibits all polystyrene products and plastic utensils and requires that �Recycle on the Go� portable recycling units are available at community celebrations. Inside the civic centre, staff are recycling and using greener choices to send 95 per cent less trash to landfills reduce housekeeping costs. The Peter J. Marshall Award was accepted by Markham Mayor Frank Scarpitti, Council members and Erich Genseberger, CEO of EcoMedia on September 29 at a Town of Markham Council Meeting. We�re Number One ... Town of Markham and EcoMedia celebrate winning the Peter J. Marshall Award. Markham now boasts a waste diversion rate of over 73 per cent, the highest waste diversion rate of any urban municipality in Canada. In the photo, from left to right (signalling Number 1) in the front row are: Kimberly Dunsmoor, Markham Waste Management; Brenda Librecz, Commissioner of Community and Fire Services, Town of Markham; Leigh Fitzgerald, Markham Waste Management; Peter Loukes, Director, Operations, Community & Fire Services Commission, Town of Markham; Erich Genseberger, (holding plaque) CEO, EcoMedia; John Livey, CAO, Town of Markham; Craig Marwood, President, EcoMedia; Frank Scarpitti, (holding plaque) Mayor of Markham; Claudia Marsales, Manager of Waste Management, Markham; and Shayne Hartin, Waste Management Department, Markham. "Markham has been working hard to change the way we think of waste collection and disposal, and to turn towards the Zero Waste model, which has significant environmental and social benefits," said Markham Mayor Frank Scarpitti. "Zero Waste may not be a literal target, but by aiming for zero, we are making much greater progress and gaining a clearer vision of how we can significantly reduce our future waste, and help Markham become a more sustainable community." The Peter J. Marshall Award is an annual competitive process organized by AMO. Awards acknowledge municipalities who have demonstrated leadership and innovation in public-private partnerships. Submissions by Ontario municipalities are judged by a panel on their creativity and success in implementing new, innovative ways of serving the public. "We are extremely proud of our business relationship with the Town of Markham. EcoMedia remains committed to growing our portable Special Events Recycling Unit segment of our business so that whenever there is an outdoor event, festival, or public gathering - whether it�s small or large - our portable units are there for people to use," said Erich Genseberger, CEO of EcoMedia. "Our units help keep the event clean, and our experience tells us that if well identified and proper recycling units are placed at an event, people will use them." PHOTO: Georgian recently purchased three portable recycling units from EcoMedia Direct. 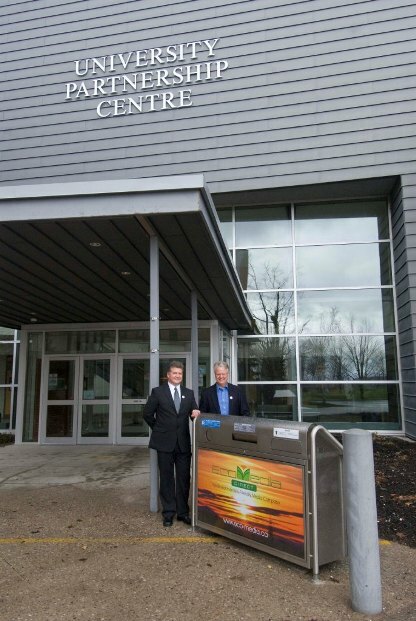 The units, which were unveiled at the grand opening of the Centre for Sustainable Technologies Sept. 17, will allow the College to capture waste and separate recyclables during special events on campus, such as the Auto Show. 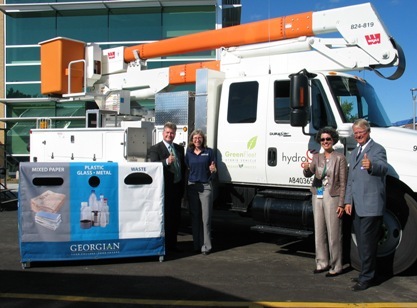 Pictured (l-r): Craig Marwood, President, EcoMedia Direct, Dianne Corrigan, Georgian�s environmental sustainability co-ordinator, Laura Formusa, President and CEO, Hydro One, and Georgian President and CEO Brian Tamblyn. Georgian has signed an agreement with EcoMedia Direct to increase the number of recycling units across the College over the next five years. This will help the College achieve higher waste diversion rates and better source separation of recyclable materials so that less waste ends up in landfill. The first units were installed at the Barrie Campus last April. The Midland, Muskoka (Bracebridge), Orangeville, Orillia and Owen Sound campuses received units in August. The outdoor units provide the same three stream separation (waste/glass, plastic, and metal/mixed paper) as the indoor hallway units and are colour coded and labelled. Annual waste audits will be conducted to determine the effectiveness of the numerous waste reduction and diversion measures that have been implemented over the past year by comparing future audit results to the 2008 baseline year. The next waste audit is scheduled for December. "Mayor McCallion helps International Centre launch its 'Green Initiative' ... from left to right, Michael Prescott, CEO of the International Centre, and Erich Genseberger, CEO of EcoMedia are joined by Mayor Hazel McCallion, at right, during the International Centre's Sustainability Launch to employees and members of the media. 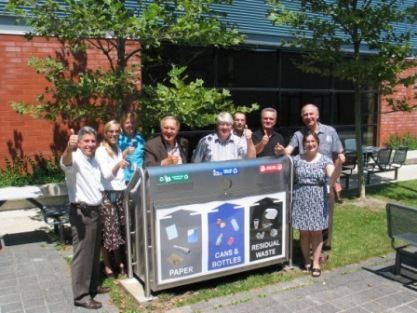 The Mayor gave the program a 'thumbs Up' while using EcoMedia's SilverBox™ Public Space Recycling Unit." Mississauga, Ontario - For decades, the International Centre has been at the 'Centre' of great events � it is home to some of the country's largest and most popular events - offering visitors superior service and inspired event solutions thanks to its highly experienced and knowledgeable staff. With the addition of a new Conference Centre and world-class kitchen facilities, the International Centre now boasts an upscale atmosphere, and an exceptional culinary experience. "The only missing piece in our development plan was the launch of a sustainability program � in all areas of our business. Today, we are taking a very important step in this direction by launching a comprehensive Public Space Recycling program using EcoMedia's SilverBox™ Recycling Units," said Trevor Lui, Director of Operations, for the International Centre. "We are extremely pleased to be partnered with the International Centre � they are an industry leader - and to have the opportunity to work with the people at this fabulous facility, and help them achieve their sustainability goals and objectives, takes us to the next level. We believe that by selecting EcoMedia's Recycling Units, the International Centre is able to visibly demonstrate that it is 'Going Green� and at the same time is adopting a durable, ergonomically proven and environmentally-friendly recycling program which can cope with the high density of event goers and the equally high volume of recyclable materials they carry into, around and out of the site," said Erich Genseberger, CEO of EcoMedia Direct Inc.
Q: Why did you decide to go with EcoMedia to help the International Centre launch its sustainability Program? A: We have been very impressed with EcoMedia's SIlverBox and their success with waste diversion. They are firmly committed to lowering contamination of recycled products, which in turn makes our job easier. Their units are modern, sleek and more importantly, recognizable. Q: When it comes to sustainability, what are your plans for the future? A: The International Centre is committed to achieving sustainability on three levels: with our employees, within our business practices and within the community. We have a very aggressive plan for each of these three areas and we hope to see some measurable results all around. The launch of EcoMedia's SilverBox is just one of the things we are doing to lessen our overall footprint and there are many more to come. Q: What are your short-term sustainability goals? What about your long-term objectives? A: We are in the audit stage of establishing our goals. We need to fully assess where we are and set a stake in the ground. Once we have done this we will be in a position to quantify our goals moving forward. Nonetheless we are committed to setting aggressive waste, water and energy reduction goals, as well as sourcing suppliers who share our vision for sustainability. Q: Have you noticed any difference since EcoMedia�s SilverBox Recycling Units were installed last month? A: We have definitely noticed less contamination with our recycling as well as less waste. 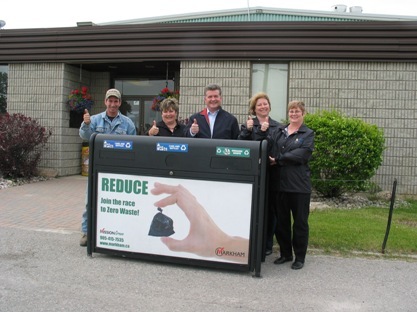 Thumbs Up for the new Agreement � from l to r: Mickey Erskine, Property Manager; Markham Fairgrounds; Karen Murphy, President, 2009 Markham Fair; Craig Marwood, President, EcoMedia; Lynda Goodwin, Administrative Assistant, Markham Fairgrounds; and Michelle Irwin, General Manager, Markham Fairgrounds, standing with one of EcoMedia's Public Space Recycling Units in front of the office of the Markham Fair. Markham, Ontario -- There�s plenty of history noticeable as soon as you enter through the front gates at 10801 McCowan Road to the Markham Fairgrounds � home to one of Canada�s oldest Country Fairs - since 1844, yes since the year 1844! This year, the Markham Fair takes place October 1st � 4th, and it has the distinction of being known as Canada's largest 4-day Agricultural Fair. With over 670 volunteers working on more than 70 committees, Markham Fair boasts the largest community-based volunteer organization in Canada. Originally, agricultural societies would meet on a regular basis to discuss various concepts of agricultural improvement such as livestock development and increased grain yields. The Fall Fair would then be an opportunity for the farmers to compete by showing off the fruits of their labour. Due to increased technology and rapid communication, agricultural societies no longer find it necessary to provide this service. The Markham Fair continues to create the forum known as the Fall Fair. Markham Fair takes place annually on the weekend before Thanksgiving, and hosts close to 75,000 attendees. Approximately 3,000 exhibitors will enter more than 12,000 items, which will be judged and put on display during the Fair. Promoting excellence through competition in this way is what makes fairs unique in comparison to other events. As well as the competitive displays, the Fair brings thousands of people together to enjoy various forms of entertainment such as horse pull, demolition derby, tractor pull, midway rides and displays of farm animals. 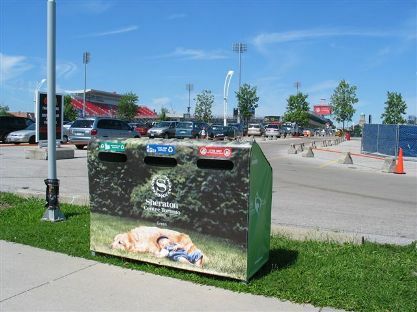 "Two years ago, EcoMedia was asked to conduct a pilot program, and deploy our SilverBox™ Public Space Recycling Units on the Markham Fairgrounds. Following a thorough review of our program, the Organizing Committee gave us the go ahead to keep our Units there on a permanent basis. We are thrilled to be a part of the Markham Fairgrounds operation, and helping them to move forward with their sustainability efforts," said Erich Genseberger, CEO of EcoMedia. Q: "Why did you choose EcoMedia as your partner?" A: EcoMedia came highly recommended. We liked the look of the recycling bins as well. The patience and understanding on the part of EcoMedia as we worked through our program to reduce waste at the Fair and during the year has been wonderful. Q: "When it comes to eco-friendly programs, what are Markham Fairground's plans for the future?" A: We are aiming to be a zero waste facility through better waste management, in keeping with the Town of Markham�s initiative. We want the Fair to be more eco-friendly, while keeping the grounds cleaner. Using EcoMedia bins is the first step. Q: "What are your overall objectives for the Markham Fair in the short term? The long-term?" A: Our short term plan is to keep the grounds cleaner by having the more visible EcoMedia bins, and to benefit financially from the advertising on the bins. In the near future, we hope to be a zero waste facility, one of the first Fairgrounds to do so. Long term, we hope to continue to be a leader in care of the environment with all our endevours. 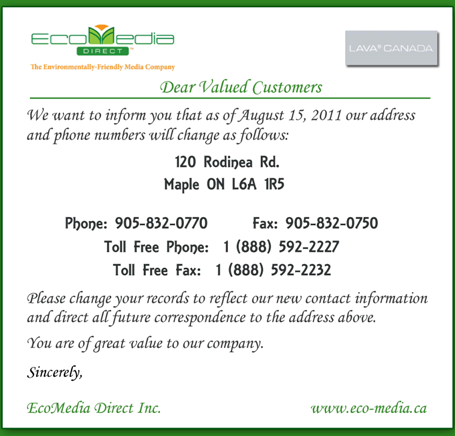 Q: "Have you noticed any improvement since EcoMedia's SilverBox™ Recycling Units were placed on the Markham Fairgrounds?" A: Since the EcoMedia bins have been in place, the grounds are cleaner. Our spring cleanup was easier, and after an event on the grounds there is noticeably less garbage. Craig Marwood, President of EcoMedia Direct, and Dianne Corrigan, Environmental Sustainability Coordinator at Georgian College, stand near one of the 14 aluminum recycling stations installed by EcoMedia as part of a Public Space Recycling Program at the Barrie campus. The containers were unveiled during the college's Earth Day cleanup. j.t. mcveigh photo. Georgian College students turned out in force on Earth Day to clean up their campus. "We've got the largest turnout we've had since I can remember," said Dianne Corrigan, Georgian's environmental sustainability co-ordinator, Wednesday. "We have close to a hundred people out today cleaning the grounds and learning about recycling and we've officially launched our outdoor recycling containers." The 14 new containers were provided by EcoMedia Direct Inc., a company that promotes public space recycling, marking the beginning of a partnership between the EcoMedia and Georgian. "Right now it's a six-month pilot study," Corrigan said. "We want to make sure how effective the units are at capturing outdoor waste." Students participating in the clean-up were enthusiastic about the way Earth Day was being celebrated. "It's needed very much," said environmental technology student Dan Trickett. "The campus throughout the year seems to be fairly trashy on a regular basis, probably out of laziness and because there's not enough bins and sorting stations. It's nice having these bins around and having so many people turn out." Kim Anderson, a student in the environmental techniques program, agreed. "I see everybody out," she said. "It's more of an awareness thing, not just cleaning up. It gets the environmental word out there." EcoMedia president Craig Marwood was on campus for the unveiling of the containers and the clean-up. "It helps raise awareness that we should be thinking twice before dropping something like a plastic bottle, aluminum can or anything like that, that could be recycled," he said. "That's what our units are designed to do: make it simple for people to take action." Corrigan says sustainability should be a continuous effort. "Every day should be Earth Day," she said. "We should all be thinking about everything we do that has an impact on the environment, whether it be energy consumption, waste production, water use or fuel consumption. Every person has an impact on the environment so we should really be thinking about it on a daily basis." "This is a great event because it puts the students themselves in action mode, which is something you want to see happen," Marwood said. Georgian College recently launched its environmental sustainability program to further the college's commitment to environmental issues. It focuses on waste diversion, sustainability reviews and environmental literacy. "We make sure that every student that graduates from Georgian has the skills and knowledge to make really good decisions with respect to the environment in their personal and professional lives," Corrigan said. "We also review all of our purchasing and procurement policies to make sure that the products that we bring on campus are environmentally sensitive." Maxx Lennox is an intern from Loyalist College. Georgian College President and CEO supports SilverBox™ Recycling Program ... Brian Tamblyn, President and CEO of Georgian College says the college's new partnership with EcoMedia meets with his enthusiastic support. 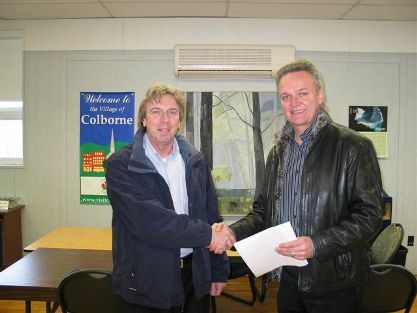 In the photo, Mr. Tamblyn, at right, joins Craig Marwood, President of EcoMedia, during the kickoff event on Earth Day. Photo courtesy of Doug Crawford, Georgian College. EcoMedia's new Public Space Recycling Program launched in Northumberland County ... from left to right, Mayor Marc Coombs, Mayor of Cramahe Township; Jim Williams, Deputy Mayor of Cramahe Township; Adam McCue, Manager of Waste Technical Support & Communications for Northumberland County; Erich Genseberger, CEO of EcoMedia; Dave Taylor, Account Manager, EcoMedia; and Dan O'Brien, Director of Community Services for Cramahe Township, officially recognize the first SilverBox™ Public Space Recycling Unit located in front Cramahe's Municipal Building in the Town of Colborne. April 22, 2009 — EcoMedia signs agreement with the 2009 World Police & Fire Games in Burnaby, B.C. BURNABY, BC, April 22 /CNW/ - Organizers for the 2009 World Police and Fire Games presented by TELUS today announced that EcoMedia Direct Inc., the Environmentally-Friendly Media Company, will be the Official Supplier of branded, portable Recycling Units to the Games. EcoMedia will be deploying up to 100 new portable Special Events Recycling™ Units - the first initiative of this size and scope at a major global sporting event. "We are committed to making our event as 'carbon neutral' as possible," said Stuart Ballantyne, CEO of the 2009 World Police & Fire Games. "Today's announcement with EcoMedia ensures we will have these proven, award-winning recycling units at some of the more than 40 venues to service the needs of the more than 10,000 athletes competing in 66 sporting events across the Lower Mainland and Sea to Sky regions of British Columbia." Erich Genseberger, CEO, of EcoMedia Direct Inc., said, "We are absolutely delighted to be involved with the third largest Sporting Event in the World which will showcase British Columbia on the international stage, as it hosts police, fire and security professionals from around the world in the spirit of friendly competition. It's a great opportunity for our patent pending, Canadian-made, Special Events Recycling Units to be utilized and showcased on the international stage set against one of Canada's most breathtaking natural settings." "Sponsorship and branding opportunities are now available for WP&FG Official Sponsors, international corporations, national companies, local firms, as well as all Police and Fire Departments throughout the world which are competing in our Games. If there are no sponsorship conflicts, there are now opportunities to brand messages on these environmentally-friendly Recycling Units, which will be deployed starting Wednesday July 29th at the pre-event Congress & Trade Show, and throughout the 10-day sporting event," said Michael Soy, Vice President, Revenue, Marketing & Communications, 2009 World Police & Fire Games. "We want to thank the municipalities in the Greater Vancouver Regional District in advance for their cooperation in making this dream a reality. To date, the response has been overwhelming. We have achieved record levels of participation in all categories. We expect to have more than 2,500 volunteers on hand at events from July 31st right through till August 9th. Our mandate is to make this event the most successful - and the greenest - in history," Mr. Ballantyne said. EcoMedia owns and operates the World's Largest Public Space Recycling™/Advertising Program. 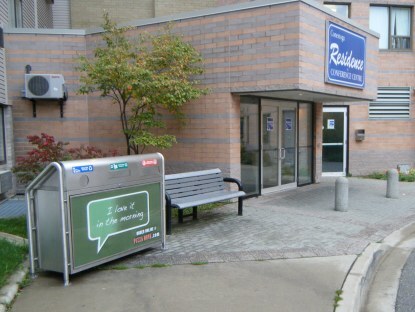 EcoMedia has, strategically deployed, over 3,600 Recycling Units with over 7,000 faces for advertising available across Toronto, Markham, and the Toronto District School Board. EcoMedia offers a variety of fixed and portable recycling product solutions to municipal and private partners. The Company has won national and provincial awards for its pioneering work in the field of out-of-home recycling. EcoMedia is currently expanding its Recycling/Advertising Unit programs nationally across Canada and internationally into the U.S.A.
"Bring it On � that's what one of the local business owners said after hearing about the Township of Cramahe and EcoMedia recently signing a multi-year agreement where Cramahe becomes the first Township in Ontario's Northumberland County to introduce an environmentally-friendly Public Space Recycling™ Program. In the photo, at left, Dan O'Brien, Director of Community Services for the Town of Cramahe shakes hands with Erich Genseberger, CEO, of EcoMedia, in Cramahe's Council Chambers. The Official Ceremony will take place on Earth Day - April 22nd at 3:00 p.m. in Colborne, Ontario." 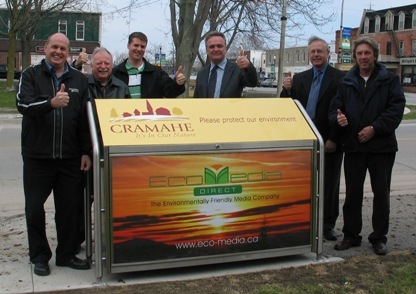 On behalf of the people in Cramahe Township, I would like to thank you, the EcoMedia Team, and your eco-friendly SilverBox™ Recycling Units, as we take bold new steps to be the first Township in our region to introduce a new Public Space Recycling™ Program, and thereby drastically improving the environment where we live, work and play. We are busy making preparations for the Celebration of our Township's new partnership with EcoMedia to take place on Earth Day, April 22nd, 2009, and I am inviting everyone to come out to Cramahe Township Town Hall in Colborne, Ontario, and join us for this wonderful day as we celebrate our Township, Province, Country and the Earth on which we live. The celebration is scheduled to begin at 3:00 p.m., so plan to get there early because we are expecting a healthy turnout, and with the festivities we have in store, the roads surrounding the Town Hall will be closed to local traffic. Mark your calendars, and please join us as we our focus our sights on increased sustainability, and collectively take steps, as a community, to divert our waste from landfill. By having EcoMedia's SilverBox Public Space Recycling Units, placed at popular locations for people to interact with them in Colborne and Castleton, we will immediately notice a marked improvement in the cleanliness and surroundings of our public space, and I urge everyone to recycle - it's fun, easy to do, and it's good for the Environment! We hope to see you there - it will be fun, no matter what Mother Nature has in store for us on Earth Day - the celebrations will go on - rain or shine - so will our forward thinking community. Erich, once again thank you and we look forward to seeing you on April 22, 2009, as we celebrate the launch of our new Public Space Recycling Program in Cramahe Township. These days, there is a marked increase in the number of readers who are turning to online publications for their daily dose of news, business, sports, entertainment and real estate, and it's widely reported that the circulation of the traditional print medium (newspapers and magazines) is decreasing. The question that real estate brokers and sales representatives have raised is how do they reach potential home buyers when one of the oldest traditional means of advertising is attracting less and less attention. The Solution: EcoMedia's new 'Just Listed' Program. "Our Real Estate sales customers began asking us for new ideas, and solutions, to help them in a challenging market, so that they would be able to differentiate themselves from their competitors, and also be able to promote their clients' properties in a unique way using high-impact, colour images, instead of the tiny, black and white photos you see in print," said Erich Genseberger, CEO, EcoMedia Direct Inc. "They wanted to immediately connect with home hunters in their local communities, and capture the attention of buyers interested in the area." 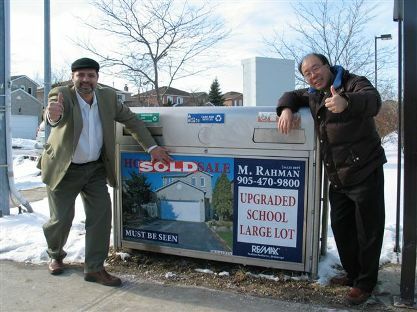 In photo at left, Mohammed Rahman, Sales Representative for RE/MAX Realtron Realty Inc., is joined by Benny Yick, Account Manager, for EcoMedia, in front of one of Mr. Rahman�s new 'Just Listed' Program SilverBox™ Recycling Units. Mr. Rahman says, "The recycling units serve the local community, and keep the neighbourhood clean. I believe more and more people � sellers and buyers - will be demanding that their real estate agent gets involved with such a dynamic program." "After extensive research, and listening to input from many of our real estate clients, EcoMedia developed an innovative solution for them, using our environmentally-friendly, interactive media products on the streets of Toronto and Markham. It's called the 'Just Listed' Program, and it was just introduced into the market using our SilverBox™ Public Space Recycling Units. To our knowledge, this is the first program of its kind anywhere in the world where SilverBox� Public Space Recycling units situated in a community are being used to market homes in the area and this in turn, helps fund the out-of-home recycling effort. Naturally, our SilverBox units are where they want to be - in highly visible, high traffic areas in the communities they serve," said Genseberger. "I really like the new 'Just Listed' concept. 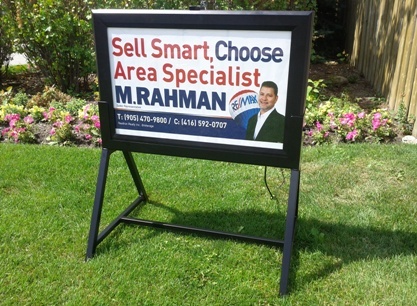 It gives me an edge in the market," said Mohammed Rahman, Sales Representative for RE/MAX Realtron Realty Inc., and one of EcoMedia's many real estate clients based in Markham, Ontario who has been in the real estate business for more than 20 years. "This program provides great exposure for property sellers - not just a few lines of printed ad space. For buyers, the property is featured on the street 24/7. The real plus is that it helps the environment. The recycling units serve the local community, and keep the neighbourhood clean. I believe more and more people - sellers and buyers - will be demanding that their real estate agent gets involved with such a dynamic program," said Rahman. Patrick Rocca, Broker for Bosley Real Estate Ltd. Brokerage, at right, is joined by Benny Yick, Account Manager, with EcoMedia, in front of one of Mr. Rocca�s new Just Listed Program SilverBox™ Recycling Units in Toronto. When asked about the program, Mr. Rocca says, "It provides great visibility, and exposure, to local traffic for my listings." EcoMedia's Just Listed Program is "Absolutely unique for sellers - and buyers - for listing awareness." EcoNews: What do you like about EcoMedia's new 'Just Listed' program? Mr. Rocca: It provides great visibility, and exposure, to local traffic for my listings. EcoNews: Do you think this program is a unique opportunity for potential buyers looking for a new home, in a local neighbourhood? Mr. Rocca: Absolutely unique for sellers - and buyers - for listing awareness. EcoNews: Do you like the fact this program is promoted on environmentally-friendly, out-of-home recycling units on the streets of Toronto? Mr. Rocca: I am very impressed with this program, and pleased with the environmentally-friendly angle it offers. Mr. Kozaris: I think it's great! It gives my listings maximum market exposure, and people will know I have that home for sale, it's good for the seller, and good for the agent. Mr. Kozaris: Yes, not always is a buyer, or buyer/agent, looking at MLS daily - this service tells all that a home is for sale. Some buyers don't have agents, and those buyers may not even look at MLS, now they see your home on a recycling box, and they know it's for sale. EcoNews: What about this program promoting the property for sale, as well as the Real Estate Broker/Sales Representative? 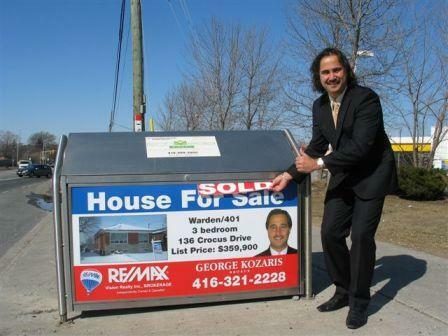 Mr. Kozaris: Again, it gives me - the agent - market exposure, and complements my marketing plan. Mr. Kozaris: Yes, it's all about the Environment, and I am glad to support that. EcoNews: How does the 'Just Listed' Program work? Erich: First, our Account Managers review the 'Just Listed' program with our clients and after they sign on we create a basic "Just Listed" design template. They can feature colour pictures of the properties they are selling and include the key details of their listings such as property features and the selling price. After our real estate clients have created a basic design template and once they have listed a property, their new "JUST LISTED" posters can be rapidly created, printed and posted at a very nominal cost to them and to their clients! Erich: When the property is sold, EcoMedia immediately places a 'Sold Sign' on the "Just Listed" poster(s) on the recycling unit. This does two things that are very positive for our clients - it informs people in the neighbourhood that the Real Estate Broker/Sales Representative has successfully sold the property. Secondly, it prompts other home owners who want to sell their homes in the neighbourhood to call the Broker/Sales Representative to list their homes with them. EcoNews: What happens after the 'Sold Sign' is placed on the posters on the recycling unit? Erich: It's up to our clients, but once the property is off the market, and the 'Sold Sign' has been on the posters for a short period of time, the Broker/Sales Representative has the option to refresh the 'Just Listed' campaign by advertising a new property - this means replacing the posters, and beginning the process all over again - it's that simple. We are excited about this new approach to promote what is happening in local real estate markets and, at the same time, our clients are viewed in a positive light for their support for Public Space Recycling. EcoNews: Is the new 'Just Listed' Program only available in the City of Toronto? 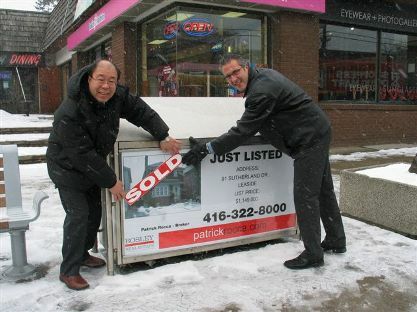 Erich: In addition to launching the 'Just Listed' Program in Toronto which runs through until the end of 2009, we are rolling it out in the Town of Markham. In the near future, we expect to launch it into new emerging markets. We are planning to expand via public and private property contracts throughout Ontario and nationally across Canada. Details on these developments will be publicly announced once these new, long-term agreements are finalized. EcoMedia recently supported ABC CANADA Literacy Foundation's annual Family Literacy Day, which was a huge success. According to Michael Coteau, Marketing Manager for ABC CANADA, "Each year, hundreds of thousands of Canadians from coast-to-coast participate in this special initiative to celebrate families reading and learning together. ABC CANADA appreciates the support of EcoMedia in helping raise awareness for the initiative and bring forward the literacy message." For more information on ABC CANADA and Family Literacy Day, please visit: www.abc-canada.org. 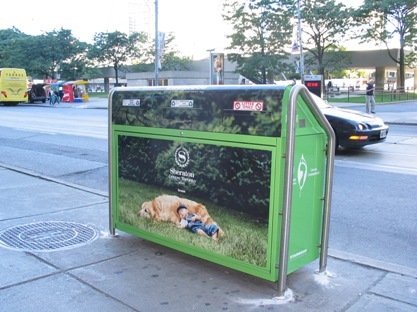 Pictured here is one of Sheraton Centre Toronto Hotel's newly wrapped SilverBox™ Public Space Recycling Units located outside Union Station in Toronto. Home to the GO Transit concourse, with links to the TTC�s city subway and bus network, and to VIA Rail�s intercity trains, Union Station has become the busiest travel centre in Canada. It started with a vision in 2008, to form an environmentally-driven Green Team comprised of hotel employees. Now, in 2009, team members at the four diamond, Sheraton Centre Toronto Hotel, located at 123 Queen Street West, in the financial and entertainment districts, have added new elements to their 'green' campaign by installing eco-friendly and innovative advertising recycling units � both on and off the streets in Toronto � using EcoMedia�s new Special Events Recycling™ Units and SilverBox™ Public Space Recycling Units, promoting their green program. Here is another one of the Sheraton Centre Toronto Hotel's newly wrapped SilverBox™ Public Space Recycling Units, located outside the hotel at 123 Queen Street West in Toronto�s downtown core, carrying on the same theme chosen for its Special Events Recycling™ Units, launched at last year's CNE. Q) Who makes up the Sheraton Centre Toronto Hotel�s Green Team? How often does your team meet? A) A team of Executive Committee members and influential operations team representatives in all departments meet once every two weeks to discuss where we are with our green initiatives and where we need to go in the future. Q) Beyond your Green Team�s recycling program, what are your objectives as you move forward? A) Our continuing plan is to create an all encompassing view on sustainable operations. Our mandate is to constantly question and critique our current practices and implement sustainable solutions. Q) Are there any lessons learned since your team was created? A) Yes. The biggest lesson is that the small things count. Always take stock of what you are doing because the opportunities for improvement are limitless and ongoing. Q) Are other Sheraton Hotels and/or Starwood Hotels & Resorts forming Green Teams? Is there a plan to share the information between the properties? A) Starwood Hotels & Resorts has created a committee for sustainable tourism and set out guidelines and practices for all properties to adopt. The focus is growing exponentially. Q) What has been the reaction of your Green Team�s recycling program � both on the street, at special events, and at your hotel? A) It has been extremely well received by all internal guests (our associates) as well as external guests. Everyone is focused on improving where they work and stay. We are all looking forward to a cleaner, more sustainable future. Pictured here is the Sheraton Centre Toronto Hotel sponsored Special Events Recycling™ Unit. Hundreds of thousands of visitors attending the CNE saw, and interacted with, the Sheraton Centre Toronto Hotel branded recycling units located throughout the site, and feedback on the new portable award-winning recycling units has been overwhelmingly positive. *** Special Note: The Hotel Association of Canada (HAC) has recognized the Sheraton Centre Toronto Hotel for participation in the HAC�s GREEN KEY Eco-Rating Program, by rewarding the hotel�s accomplishments in environmental management and corporate social responsibility. Congratulations to The Sheraton Centre Toronto Hotel on receiving a �GREEN KEY� Plaque from HAC as part of its impressive 4 GREEN KEY rating! 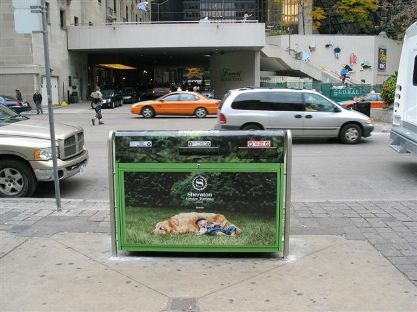 EcoMedia is an Environmentally friendly Out-of-Home advertising company. 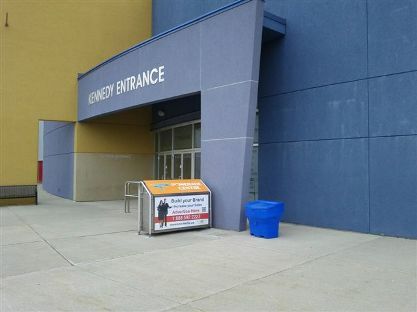 Our team of professionals will provide you with solutions that will meet, even exceed, your OOH requirements in order to deliver the most effective message to Municipalities, City�s, Hockey Arenas Colleges/Universities, Elementary and High Schools throughout Canada. While we work to provide you with the best possible advertising treatments, we will work with you to meet your budget. We pride ourselves on being a full-service supplier with the ability to take your project from inception to environmentally-friendly post-campaign, ad materials disposal. We pride ourselves on being a full-service supplier with the ability to take your project from inception to environmentally-friendly post-campaign, ad materials disposal. Our services include but are not limited to, Detailed Project Proposals, Project Management, Graphic Design, Print Production and a weekly posting schedule. EcoMedia is committed to conserving and protecting the environment by using only Environmentally products displaying your advertisements. It is our mandate not to use any Materials which can not be recycled at end of life, whether it is print material or capital Assets. We are determined to develop and deploy new products and programs to help preserve our planet.